The urban interventions are my favorite part of every metropolis, hence I always try to find new ones. However, this black and white piece of graffiti art is hard to miss because it is one of the largest painted surfaces in Ljubljana. “Urban jungle”, made by art illustrator and designer Miron Milić, created mural that fits perfectly in the area of the city centre. The chosen wall painting seems to be more than an excellent solution for exploring the phenomena of consumerism and a sustainable lifestyle in connection with young urban cultures. Note that it is located right on the facade of Mahrova house and it majestically rises above the Ljubljana central market. Did the big wall impress you? If so, I would suggest you to follow the wall and just a stone’s throw away you will find another magnificent piece of art. 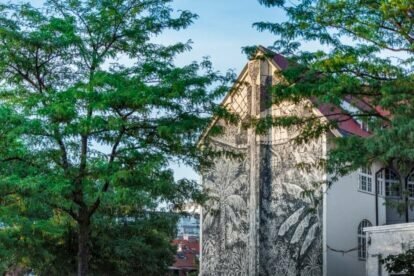 The wallpaper of a sitting girl is one of the 16 new Ljubljana art graffiti that were made by French photographer and filmmaker Julien de Casabianca. His “Going Out!” project is based on the classical works of art, which are usually isolated in the environment of art institutions – galleries and museums – being mapped to public spaces and shared with everyone on the street. The girl from the wall – a red-haired girl Henrika Šantel – is a copy of one of the images that you can find in a smaller scale in the permanent collection of the National Gallery. What a magnificent idea!